A fourth-grade boy from New Jersey's application for a coveted opening with NASA. It sounds like a position straight from a science fiction novel, but one 9-year-old boy believes that he's the right person for the job. The opening for a planetary protection officer at NASA has been generating a lot of buzz after the agency posted the position last month. The excitement is warranted – a PPO rakes in well over six figures whose duties include advising robotic and human spaceflight missions. 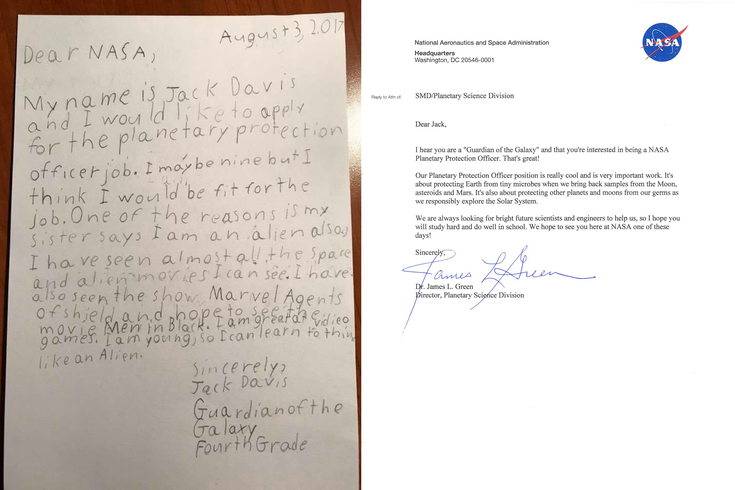 Jack Davis, a 9-year-old fourth grader from New Jersey, who also goes by "Guardian of the Galaxy" decided to throw in his application in the form of a one-page letter, NASA announced in a news release Friday. One of his top qualifications? His sister "says [he's] an alien." "I have seen almost all the space and alien movies I can see," he wrote in the letter dated Thursday. "I have also seen the show 'Marvel Agents of Shield' and hope to see the movie 'Men in Black.' I am great at video games. I am young, so I can learn to think like an alien." While some employers take two weeks to get back to an applicant, Dr. James Green, director of NASA's Planetary Science Division, wasted no time in responding. In addition to a letter, Jack also got a phone call from NASA's Planetary Research Director Jonathan Rall to congratulate him on the application. "We are always looking for bright future scientists and engineers to help us, so I hope you will study hard and do well in school," Green wrote in the letter to Jack. "We hope to see you here at NASA one of these days!" Green said in a statement that encouraging children to grow and learn is important. "At NASA, we love to teach kids about space and inspire them to be the next generation of explorers," Green said. "Think of it as a gravity assist – a boost that may positively and forever change a person's course in life, and our footprint in the universe." While the job may seem futuristic, it's been around since the 1960s, according to NASA. Interested? NASA will be accepting applications until Aug. 14. Check out more about the position here.